Note to Parents: Help your family embrace God’s love for the world. 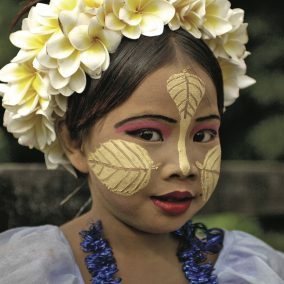 Read this story together to learn about and pray for the Shan, a people group in Southeast Asia. Hi. I’m Nang Kham (nang kom). I live in this village with Grandmother and Younger Brother. My father was a rice farmer here in Shan State until the Burmese army took most of our land along with the bull we used to plow it. Father could not find a job so he and Mother moved across the border into Thailand. Father works long hours in construction. Mother weaves and sews cloth purses that she sells at local markets. My parents send some of the money they earn to Grandmother so that she can buy food and other things we need. My brother and I go to school at the Buddhist temple for a few hours each week. The local monks teach us to read and write. Most days, we help with chores like laundry, fetching water, and gardening. Before we go out in the hot sun, Grandmother smears our arms and face with thanaka (tah-nah-KAH), a yellowish paste that works like sunblock. It is made from ground-up tree bark mixed with water. Sometimes Grandmother creates designs like flowers or leaves on our cheeks – just like face painting. Dressed in her straw hat and long wrap-around skirt, Grandmother heads outside to our small garden. No rain has fallen for weeks so the chili peppers, soybeans, tomatoes, and onions look withered. I fetch water from the river and help Grandmother pour it on the plants. Picturing the spicy hot relish that these vegetables will become makes my mouth water – yum! Grandmother believes that our failing garden is the work of spirits. She hurries inside to light candles and set out small bowls of rice in several places around our home as an offering to them. I touch the special charm on my necklace meant to protect me from spirits who might try to harm me or cause illness. As I go inside, I look up at the dried flower arrangement hanging over the doorway. The spirit man in our village blessed these flowers a few months ago. Surely they will protect our home from any evil spirits who might want to enter. Ask God to send goers (cross-cultural workers) to share the good news of Jesus with Shan families in Myanmar and Thailand. Pray that as Shan families learn about the loving God who wants to have a relationship with them, their fear of spirits will be replaced with trust, peace, and hope. Coming up next: Watch for an art activity to learn how the Shan protect their skin from the hot sun.